Tuesday Evenings, April 16 – May 21, 2019 | 6:00 – 8:00 p.m.
Join Kristy Regan, a holistic Nutritionist and author of The SIBO Diet Plan, to learn more about small intestinal bacterial overgrowth (SIBO) and cook SIBO-friendly, low FODMAP recipes. Whether you’re newly diagnosed with SIBO or you want to take a fresh look at your menu choices and your digestive health, we welcome you to this six week class! During each two-hour session we’ll cook three straightforward, healthy recipes together, dine as a community, and discuss important SIBO topics that can improve your symptoms and long term health. As part of the class, you’ll receive The SIBO Diet Plan book, which includes over 90 recipes, including everything we’ll be making in class. Kristy Regan, of Vital Food Therapeutics, is a holistic Nutritionist and author of The SIBO Diet Plan. She specializes in working with clients who have digestive disorders, including SIBO, IBS, IBD, and leaky gut. Her practice combines nutritional therapy, lifestyle education, and counseling to assist clients in their healing journeys. Kristy was diagnosed with SIBO when little information was available. This led to a multiyear journey in conducting SIBO research, developing her own inner authority, discovering new ways to cook, and creating delicious new recipes. She appreciates how important it is to address both physical and emotional health. She is also aware of the role gratitude and presence play in supporting us in feeling whole while we are in the midst of healing. She is passionate about sharing her insights and expertise in cooking, nutrition, health, and mind-body therapies via podcasts, classes, and speaking engagements. Kristy is available for individual nutrition and wellness appointments online worldwide. 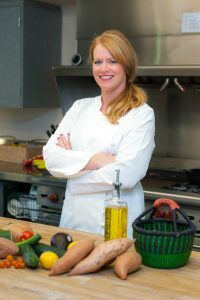 Visit her website, VitalFoodTherapeutics.com for free recipes and digestive health information.